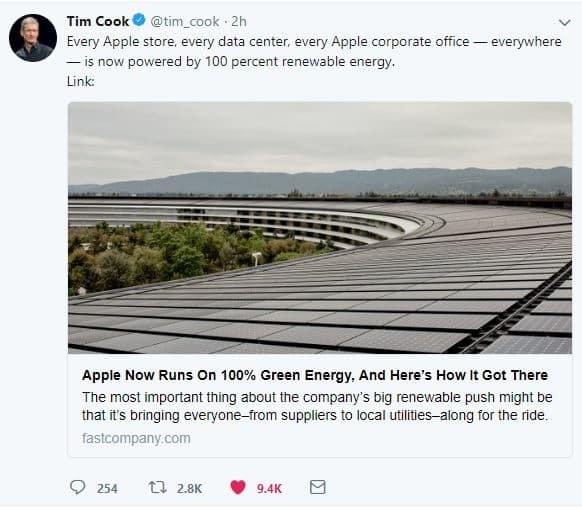 Just in case you needed another reason to love Apple, CEO, Tim Cook, announced today on Twitter that Apple runs on 100% green energy. Powering Apple’s data centres, particularly the Reno Nevada data centre where Siri, iCloud, Apple Music and Apple Pay live, takes a lot of constant, uninterrupted power. This led Apple to develop renewable energy sources, including their first solar farm named Fort Churchill, surrounding their various data centres. As the large computing machines used in data centres require more power than any of Apple’s other facilities, their initial goal was to deliver 100% renewable energy by 2014 to their data centres. Having reached that goal, they set their sites on the rest of their facilities, which now, after 6 years of effort, operate on 100% green power. 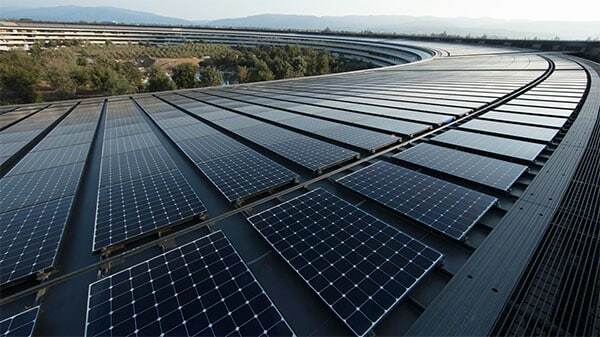 From the Apple Park Headquarters, which has been outfitted with one of the largest solar roofs on the planet, to distribution centres and retail outlets all around the globe, all now run on 100% green power. In addition to making their own efforts to ensure a green future, Apple have also convinced 23 companies in its supply chain to get to 100% renewable energy for the portion of their business that deals with Apple products. Apple says it now has 25 operational renewable energy projects in 11 countries with 15 more in construction. In 8 years Apple were able to grow their renewable energy efforts from 16% of facilities powered by renewable energy to 96% in 2016, to now 100% in 2018.